Yuri Juárez (Lima-Peru 1973), guitarist, arranger and composer, began his career in 1996. He currently resides in New York City. 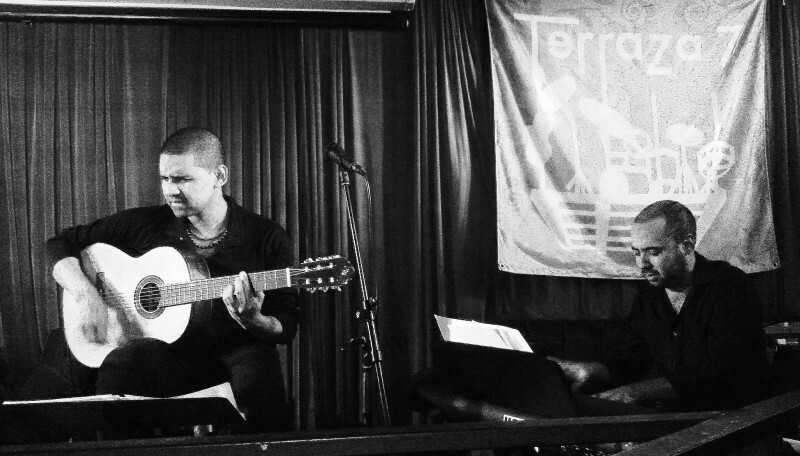 His musical training ranges from formal studies with the Afro-Peruvian masters of the guitar Pepe Torres, Alvaro Lagos and Jorge Madueño and more “street” experience in Afro-Peruvian peñas. He has shared the stage and recorded with musicians like Eva Ayllón, Susana Baca, Arturo O’Farrill, Chaqueta Piaggio y Mariella Valencia, and iconic Peruvian composers such as Kiri Escobar and Javier Lazo. In November of 2008 Yuri released his first album. Afroperuano with its own repertoire and important composers Chabuca Granda, Carlos Hayre and Chucho Valdes, achieving great success in domestic and international criticism. In December of 2009 gets the Latin Jazz Corner Awards in the categories of Best Afroperuvian Jazz Album and Best Latin Jazz Guitarist debut for his “Afroperuano”. In 2012 Yuri launched a new album project, a collaboration with Argentinean singer Sofía Tosello entitled Tangolandó, exploring a refreshing fusion that connects musical styles such as tango, milonga, lando, festejo, waltz all in one unique and innovative sound. No Replies to "YURI JUÁREZ AFROPERUANO GROUP"